Are you banging your head to get more results from your blogging? It might at times get bit complicated if you are not too sure about the things you are doing. While blogging you often wonder why you are not getting the desired results. It might have happened that you have never realized that while being a blogger you have committed some serious blogging mistakes and never got a notice about it. Let see some common mistakes we often commit without realizing and which, if corrected can surely give you better yields. Often the common mistake bloggers usually make is to relate with their audience. You will find many blogs where the bloggers understand the topic, but they somehow fail to relate or connect to their audience. Bloggers have to understand the problems their audience are facing and how they can craft the useful information which the audience wants. Otherwise it fails to serve the purpose for the audience and therefore gradually lose the momentum for its readers. Bloggers often try to cater to all the sections of readers. But you just cannot be “Jack of all trades and master of all”. You just cannot beat the factor that clarity and focus are the essence of any business. Say suppose you are a Chef and are blogging for different ways of cooking food, you just cannot randomly write about travel and tourism. Instead delve more deeper into the varied shades of experimenting with food. This way you will be able to keep your audience intact and they will always wait for your latest posts! This way you also make it clear as to how passionate you are about your niche. Inconsistency or discrepancy is another very common mistake which most bloggers often do in terms of quality and in publication frequency. But often this works as a trick because both of these elements are essence of success and work as opposing forces. Often you feel that you only blog when you have something to say, but that is actually not right. The basic thing that you should keep in mind is that frequency of publication (weekly/monthly/quarterly). You create a routine and gradually over time you audience gets accustomed to your publication and each time they will wait for it. But making publishing routine does not mean throwing up any garbage as you have committed to give three posts every week. Quality always surpasses frequency. Two outstanding posts per week will topple over five average posts per week. A balance between the need to be publication routine and the need for steady quality is the key to successful long-term blogging. I think a lot of bloggers focus on quantity versus quality and guess it is the biggest mistake a blogger can ever do. A theory that states one needs to blog a few times a week to make his/her blog always seem fresh; both from the angle of readership and also from a search engine perspective. The advantage is a boost in quantity—perhaps also a gain in page ranks—but definitely a loss in quality. A good blog or post needs in-depth research, write and edit. Unless you are equipped with a team of professional writers, there’s not enough time in a day to it all by yourself thus leading to under-performing material. Are you that interesting to write about yourself? If the answer is no, stop writing about yourself and write about something that your readers will find useful, interesting or entertaining. You have to understand that your readers are selfish. If they don’t find topics of their own interest they would just stop reading. Don’t make it always your individual opinion. Sure, put your own personality into your content or add a post or two about something that has happened to you and is noteworthy, but along with that write about interesting stuff. A blogger’s main target is the same as any other writer: to get readers. The more readers you get the better it is. And you have to keep in mind the best thing to get your readers ignore your blog or posts is bad writing. With the ever increasing demands for content nowadays you hardly get to see good writing. It’s not uncommon to find errors with formatting, spelling and grammar littered throughout blog posts and articles published online. The biggest mistake bloggers make is failing to engage readers with a compelling title and an opening statement or question that supports it. Think of the title as the label of a package, one that will only be opened if the label clearly or cleverly describes what’s inside. Once the package is opened, the first few lines have to hook the reader again by delivering on the promise of the label. When both the title and opening work together, the remaining content is willingly consumed. Try Copyblogger’s How to Write Magnetic Headlines or Jon Morrow’s Headline Hacks if you are just getting started. Often bloggers talk a lot about themselves—their own products or their services—on their blogs and that the best way to go about it. If prospective customers are seeing your blog for the first time, they don’t care about you yet. They care about their problems and how your product or service can solve them. Informative content such as tips/tricks or how-to posts are much more effective. Whether you’re a furniture company giving home decorating tips, or a B2B marketing analytics software company giving marketing tips, informative content puts the customer first and build trust before the sale. That’s how you build relationships and create a community that will advocate for you. The biggest mistake a blogger often makes is not to take the time to respond thoughtfully to comments and interact with readers. Interacting by responding to comments and questions is an important way to build readership because readers who are acknowledged are likely to come back. It seems that some writers approach blogging as a unidirectional means of communicating (i.e., “I have something to tell you”) rather than an active conversation within a community. Although the content might be quite interesting, the richness often comes through the back and forth with the audience. Not only were great questions asked that benefited other readers, but the comments also helped me realize what readers are interested in hearing more about in future posts. One of the largest mistakes new bloggers make is running the show all alone by oneself. There is no dearth of talented writers who might love to form a community blog based around wonderful content in your area of expertise, which would speed-up your blog’s development with more promoters and give you a wider social circle to pull from for comments and sharing. You will always have to welcome a blog community and learn to be associated with the community. Another mistake many bloggers make is that they sacrifice keyword-rich titles for clever, drawing attention through headlines they feel might share better socially. However, doing so will ensure a quick trip to social media wasteland and cause your content to be overlooked by its best friend, the search engine. With a keyword-rich title, your blog post will live on in search indexes and become a resource instead of a flash in the pan. For a catchy title, put your keywords first, add a colon, and write an attention-grabber. Keep in mind that blogging is the social media rope which binds the room together. So ensure you’re getting it the attention it deserves. A ‘permalink’ natural-language and keyword-rich URL. Section headers that are descriptive and utilize keywords specific to each section. ‘Anchor’ text (the text that is hyperlinked) that contains keywords relevant to what’s being linked to; and, most importantly. Self-hosting your blog instead of using Blogger or WordPress. Also, a blog should have an SEO plug-in like “WordPress SEO by Yoast” or in some way be set up so that bloggers can craft their own title and meta description tags for each post. All of these elements should convey the subject matter of the post in a keyword-rich manner, top to bottom. If a blogger can think and eventually try to implement and rectify these mistakes then he/she would get the best results one can think of. Do you think that there are mistakes other bloggers are making that I haven’t mentioned here yet? 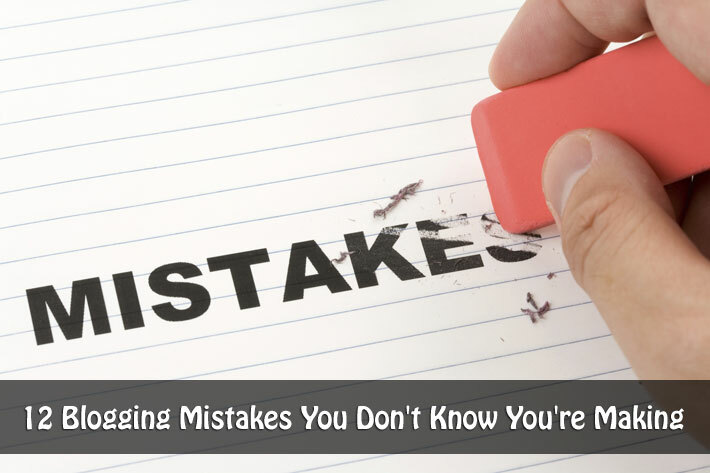 Or have you made any of these mistakes yourself? Great information in your article. I’m struggling with increasing my blog traffic. I will try some of your suggestions. All these blogging mistakes really stops the bloggers to get success in their blogging career. Every blogger should aware from these mistakes and try to not to do these blogging mistakes. Thanks. Glad you found them helpful. Thanks for reading Avinash! Having a new blog, I learned a few tips here. Thanks for the advice – I could use it. The quantity over quality thing is a biggy. I would rather write on great post for my blog than 10 mediocre ones. It is actually more time efficient in terms of results, although it doesn’t feel like it when you are putting the work in! Saha, many thanks for this spot on article. I’ve been struggling to get my own blog off to a good start, but your suggestions actually have provided me with some nice clarity on where I’m stuck. Thank you. I’ve bookmarked and am inspired to outline a blog calendar with this post as reference this week. Thanks Julie! I am glad you found everything so helpful. Please let me know if you need help with anything else. Hi Saha, Great article and overall loads of ideas I have taken away for my personal project.